Your day-by-day itinerary now includes Blanko Kitesurfclub. Head to Medina of Tunis and Rose Mandarinefor some retail therapy. Venture out of the city with trips to Hammamet (Carthageland, Yasmin Hammamet, & more) and Ichkeul National Park (in Bizerte). And it doesn't end there: examine the collection at Bardo Museum, view the masterpieces at Roumouz, make a trip to Bab Jedid, and take in panoramic vistas at The doors of the medina. To find where to stay, traveler tips, photos, and more tourist information, you can read our Tunis trip builder tool . 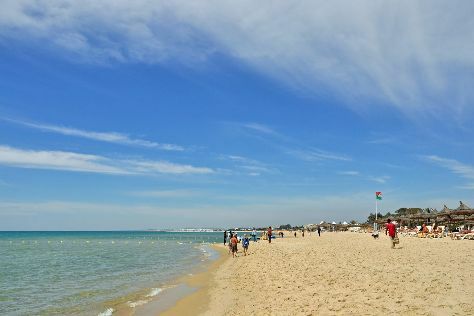 If you are flying in from Palestine, the closest major airports are Tunis Carthage International Airport, Enfidha - Hammamet International Airport and Monastir Habib Bourguiba International Airport. June in Tunis sees daily highs of 36°C and lows of 22°C at night. Cap off your sightseeing on the 30th (Sun) early enough to travel back home.